University of Missouri, 9780826219794, 288pp. Part crusader, part comedian, Jim Murray was a once-in-a-generation literary talent who just happened to ply his trade on newsprint, right near the box scores and race results. During his lifetime, Murray rose through the ranks of journalism, from hard-bitten 1940s crime reporter, to national Hollywood correspondent, to the top sports columnist in the United States. 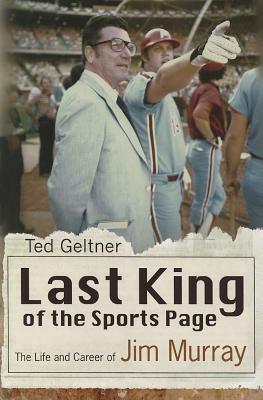 In Last King of the Sports Page: The Life and Career of Jim Murray, Ted Geltner chronicles Jim Murray’s experiences with twentieth-century American sports, culture, and journalism. At the peak of his influence, Murray was published in more than 200 newspapers. From 1961 to 1998, Murray penned more than 10,000 columns from his home base at the Los Angeles Times. His offbeat humor and unique insight made his column a must-read for millions of sports fans. He was named Sportswriter of the Year an astounding fourteen times, and his legacy was cemented when he became one of only four writers to receive the prestigious Pulitzer Prize for coverage of sports. Geltner now gives readers a first look at Murray’s personal archives and dozens of fresh interviews with sports and journalism personalities, including Arnold Palmer, Mario Andretti, Kareem Abdul-Jabbar, Yogi Berra, Frank Deford, Rick Reilly, Dan Jenkins, Roy Firestone, and many more. Throughout his life, Murray chronicled seminal events and figures in American culture and history, and this biography details his encounters with major figures such as William Randolph Hearst, Henry Luce, Marilyn Monroe, Marlon Brando, John Wayne, Mickey Mantle, Muhammad Ali, and Tiger Woods. Charming and affecting moments in Murray’s career illustrate the sportswriter’s knack for being in on the big story. Richard Nixon, running for vice president on the Eisenhower ticket in 1952, revealed to Murray the contents of the “Checkers” speech so it could make the Time magazine press deadline. Media mogul Henry Luce handpicked Murray to lead a team that would develop Sports Illustrated for Time/Life in 1953, and when terrorists stormed the Olympic village at the 1972 Munich games, Murray was one of the first journalists to report from the scene. The words of sports journalist Roy Firestone emphasize the influence and importance of Jim Murray on journalism today: “I’ll say without question, I think Jim Murray was every bit as important of a sports writer—forget sport writer—every bit as important a writer to newspapers, as Mark Twain was to literature.” Readers will be entertained and awed by the stories, interviews, and papers of Jim Murray in Last King of the Sports Page. Ted Geltner is a writer and journalism professor at Valdosta State University in Valdosta, Georgia. His most recent book, Blood, Bone and Marrow: A Biography of Harry Crews, was chosen by Publishers Weekly as one of the best books of 2016. His first book, Last King of the Sports Page: The Life and Career of Jim Murray, was published by University of Missouri Press in 2012. Before coming to academia, he was a newspaper reporter and editor for 17 years in California, Florida, and Pennsylvania. He lives in Gainesville, Florida.